Switch off the ignition, the lights and all electrical consumers. Open the appropriate fuse box . If the metal strip is melted this indicates that the fuse has blown . Shine a torch onto the fuse. This will help you to spot the blown fuse more easily. If applicable, take the plastic pliers out of the fuse box cover. 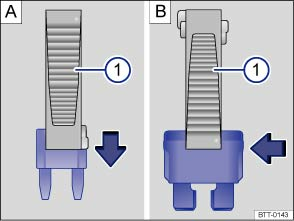 For small fuses, push the catch on ① from above A. For bigger fuses, push the catch ① onto the fuse from the side B. 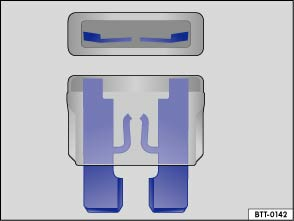 If the fuse has blown, replace it with a new fuse of the same amp rating (same colour and same markings) and same size . If necessary, re-insert the plastic pliers into the cover. You can damage another position in the electrical system by using a fuse with a higher amp rating.